New/Transient: the entity is not associated with a persistence context, be it a newly created object the database doesn’t know anything about. Persistent: the entity is associated with a persistence context (residing in the 1st Level Cache) and there is a database row representing this entity. Detached: the entity was previously associated with a persistence context, but the persistence context was closed, or the entity was manually evicted. Removed: the entity was marked as removed and the persistence context will remove it from the database at flush time. Cascading allows propagating a given event from a parent to a child, also easing managing entities relationship management. During the flush time, Hibernate will translate the changes recorded by the current Persistence Context into SQL queries. Notice the slug property is marked with the @NaturalId annotation since this represents a business key. Hibernate did not execute the DELETE first as we did in our test case. It executed the INSERT statement first, and that’s why we get the ConstraintviolationException. You may wonder why this is happening since we are calling remove prior to adding the second post entity, and the answer is flush operations order. So, the DELETE statements are executed right at the end of the flush while the INSERT statements are executed towards the beginning. However, just because we can flush the Persistence Context manually, it does not mean this is the right way to do it. Te UPDATE will leave the index entries as is while the remove-and-insert operation will incur additional work on the database side because both the table record and all index entries (Primary Key, the secondary index for slug) must be removed only to be re-added back. 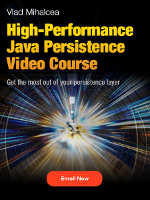 Knowing the flush operation order is very important when using JPA and Hibernate. 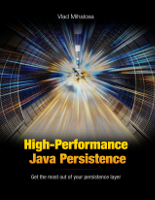 Because Hibernate executes the SQL statements in a strict order, JDBC batching can be applied automatically. If you think you need to flush the Persistence Context manually, think twice. You might have a remove-then-insert use case which is better handled by a single entity update instead. Thanks for the detailed explanation. I’m just wondering why hibernate keeps order of operations happening at flush time like that? The java doc says ‘Execute all SQL (and second-level cache updates) in a special order so that foreign-key constraints cannot be violated’. Would you mind elaborating more on that? Every time you do inserts and deletes automatically, you need a certain order because of the parent-child cascading concerns. Yes, but I m just wondering why hibernate won’t execute the actions(inserts/updates/deletes) chronologically? Because if it did that, you’d get ConstraintViolationExceptions. I don’t have any particular example for that, but you could try to modify Hibernate to see what exactly could happen if we did it that way. I have an entity which has as primary keys 3 fields and I need to modify one of them. Just calling merge is not possible as it is part of the id. What i did was to remove the entity, call flush and then persist it. And as this is part of migrating more entities with the old id to a new id, after the persist i realised I need another flush. Can you please tell me the correct way to do this? If this is executed from a @Transactional service, you should not call flush() at all since the commit will call flush anyway.